During our February 2016 trip to South Africa, we had the privilege to spend two days with Sune and Bartho. We spent many hours with friends talking about wine, the culture, and the business. I truly enjoyed it. The following day Bartho and his son Pieter Willem arrived at their farm with Nouvelle white grapes that would be blended with a Pinotage. 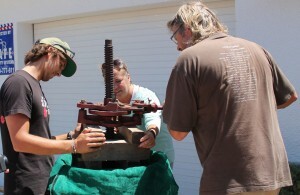 The wine will be made available for the Cape Winemakers Guild. The annual Nedbank Cape Winemakers Guild Auction takes place on the first Saturday every October and showcases the finest and most exclusive wines produced by some of South Africa’s leading winemakers in small quantities exclusively for this auction. Bill – Bartho, wine has been a part of your family for generations. Did you always want to be a winemaker? Or, was there another path you wanted to pursue when you were younger? Bartho – Those days after school we had to do compulsory military training, which was a good thing as I was unsure about which career to pursue. My parents had then just sold our family wine farm in Franschhoek, La Bri, so I knew I couldn’t go back to the farm. I saw an advertisement in a newspaper about studying winemaking at Elsenburg Agricultural College which intrigued me and I applied. From Day 1 I knew it was the right career choice. Bill – Sune, you were practising law as a state prosecutor prior to meeting Bartho. What was your draw to Bartho and the wine world? Or was Bartho the one serenading you with his wine? Sune – Long story, it will take about 2 weeks! Bartho gradually pulled me into his world, and it helped that I always loved cooking and experimenting with alternative and interesting things in the kitchen. Adding wine was an interesting angle (we didn’t grow up with much of a wine culture) and it proved to be extremely pleasant and satisfying to pair Bartho’s wines with an array of our favourite seasonal and regional dishes. And he was extremely cute in a wetsuit the first time I met him when water skiing on the Breede River! Bill – What was the leading factor or events that you both decided to start Wijnskool? Can anyone with a passion wanting to learn more about wine attend your classes? 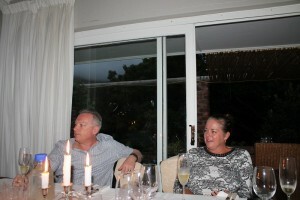 Sune/Bartho – Bartho was awarded the prestigious Diners Club International Winemaker of the Year award in 2010. It’s a bit like winning an Oscar! At that stage, we already planned the Wijnskool project and had a lot of things in place for the takeoff, but lacked the final capital injection to launch. Diners Club stepped in with a sponsorship and is still on board as a major sponsor – wonderful corporate partner for the project. Anyone can attend a wine course at Wijnskool, from teenagers still at school, career chasers, corporate groups, wine lovers, food & wine hobbyists, entrepreneurs. We even do tailor-made courses and internships. It is a seriously fun subject, no matter if you want to make a career or just a hobby of it. 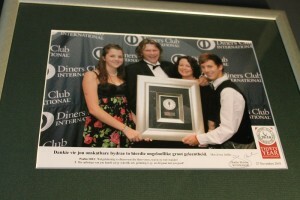 Bartho, Sune and their children at the Diners Club WineMaker of the year celebration. Bill – You both started the Academy Wijnskool at Hoër Landbouskool Boland. It is my understanding that this is a high school devoted to agriculture and winemaking. Is this accurate and can you tell us more? What do your students learn? Sune/Bartho – Boland Agricultural High School’s curriculum is the same as any other academic high school, with the difference that you can attend the agricultural version of some subjects, eg agricultural science / economics / technology. Our students attend an extramural wine course which teaches them winemaking in practice as well as theory covering the international world of wine, basic viticultural practices, social responsibility pertaining to alcohol and responsible use of alcoholic products. Although they sit an exam the course is aimed at expanding horizons and assisting high school learners in making the right subject choices and eventually career choices, should they be interested in pursuing a career in the magic world of wine. 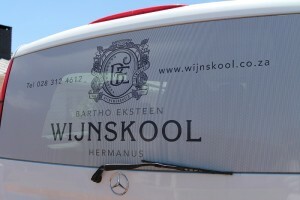 We consider this the first tier of training at Wijnskool, which can be followed up with tertiary training at colleges or the University of Stellenbosch / Elsenburg or WSET courses (aimed at retail careers) and later on our Entrepreneur Support Programme if a candidate wants to set up his/her own wine industry related business. 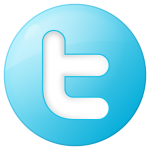 Bill – How is the Academy Wijnskool at Hoër Landbouskool Boland funded and does it accept donations? If so, how would one donate to the school? Sune/Bartho – We personally and Diners Club are the main contributors to the project, and at the take off suppliers to the SA wine industry were very generous and assisted wherever they could. As these things go, sponsorships have now tapered down and we welcome contributions to fund projects such as our vineyard project, construction of the new training facility and winery and developing our Entrepreneur Support Programme. Anyone who would care to contribute can contact us on +27 (0) 72 323 5060 / sune@hermanus.co.za / bartho@hermanus.co.za, or visit our website www.wijnskool-academy.co.za for more information. 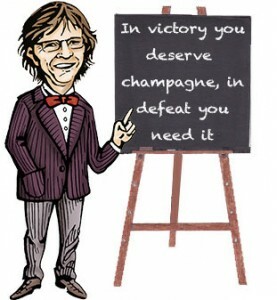 Bill – “Monsieur Sauvignon Blanc”, tell me what draws you to this varietal? After drinking your recent vintage Vloekskoot Sauvignon Blanc I can say it was excellent! You are the Master of Sauvignon Blanc. Bartho – In 1993 when I was appointed as the first winemaker at Wildekrans in our neighbouring town of Bot River, I realised the potential of the varietal in a cool climate. We immediately had success with our first Sauvignon Blanc and it just dawned on me how fantastic it is to develop this finicky varietal to its full potential making maximum use of the benefits of cool pockets in a relatively warm country. Terroir plays an all important role, I’m just the jockey who steers the grape and ultimately the wine in the right direction. 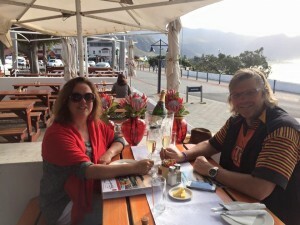 Bill – You have started developing a farm in Hemel-en-Aarde Valley, Hermanus. Chris and I had the privilege to visit last February and it is a beautiful place. When will you start planting vines and what varietals will you plant? Is there a particular reason these varietals are chosen? Sune/Bartho – We hope to start soil preparation soon and do plantings in Spring this year. Bartho’s passion lies with Sauvignon Blanc as well as Rhône-style blends and he loves blending in general. Naturally we’d love to plant Sauvignon Blanc, but, as we have a great source of grapes from independent wine growers in the Valley, the land is very expensive where we bought and our farm is very small, we had to make a decision which makes good business sense. So we’re planting Rhône (Shiraz, Mourvèdre, Viognier) varietals on one site, Champagne varietals (Pinot Noir, Chardonnay, Pinot Meunier) on the other suitable sites. Both wine styles which demand a higher price – it will always be small produced / special releases. 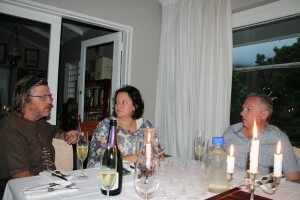 Bill – What do you think makes South African wines unique? Sune/Bartho – No other country in the world has such a vast spectrum of terroir as SA. We can compete internationally from top to bottom. Bartho, Sune and son Pieter Willem pressing fruit. Bill – Sune, what is your favorite varietal? Is there a particular reason? Bill – Is there a varietal you have not worked with that you would like to and why? Bartho – We may just decide to do a barrel or 2 Pinot Noir in vintages which favour the grape, seeing that our farm is situated in SA’s prime Pinot Noir area. Otherwise, it will be destined for sparkling wine.